When human being colonize other Solar bodies, how will they see to their basic needs? Already, research has been performed to determine where colonists would be able to procure water, how they might grow their own food, and where and how they might live. But what about the finer things in life, the things that make all the hard labor and sacrifice worth it? In case it’s not clear yet, I’m talking about beer! If and when Lunar or Martian colonies become a reality, will the colonists be able to brew and enjoy their own beer? Or will imported beer be the only thing available to them? That’s the question a team of bioengineering students from the University of California San Diego sought to answer. As finalists who competed in the Lab2Moon competition being held by TeamIndus, they combined their love of beer with their love of space exploration. As the only Indian team in the Google Lunar XPRIZE competition, TeamIndus has been working on a privately-funded spacecraft to send to the Moon. Once complete, TeamIndus hopes to conduct a soft landing on surface of the Moon later this year. Their accomplishments so far include being one of the five teams selected to compete in the Milestone Prizes and successfully winning the $1 million Milestone Prize for their landing technology. The Lab2Moon competition was held in order to see a youth experiment brought to the Moon aboard that spacecraft. And while their experiment did not take home the top prize, their final prototype will still be going into space. Thanks to Synergy Moon, who won an XPrize verified launch contract, the experiment will be launched aboard a rocket this December (the planned launch date si currently Dec. 28th, 2017). For the sake of their experiment, the UC San Diego team – all undergraduates with the Jacobs School of Engineering – sought to test if yeast would be viable in a Lunar environment. As the key ingredient in the production of beer (and many other beneficial things), thieir experiment sought to determine if Lunar colonists will be capable of becoming their own brewmasters. Their team name is “Original Gravity”, a delicious pun that alludes to both brewing and the Lunar conditions they are investigating. In the case of brewing, Original Gravity (OG) is the measure of sugars dissolved in the wort (the beer before it is fermented). In the case of the Moon, it refers to the fact that Lunar gravity is just 0.165 times that of Earth’s, which could affect the behavior of the microorganisms like yeast. With sponsorship from the Omega Yeast Labs, the team designed a unique brewing system. First, all the prep work that precedes the adding of yeast – for instance, combining malted barley and water to create wort – would take place on Earth. Second, the team plans to combine the “fermentation” and “carbonation” phases – which are usually done separately – into one phase. This process makes for a system that is much easier to design, eliminates the need for releasing accumulated CO² (which can be a hazard) and also prevents the possibility of over-pressurization if anything in the system fails. Last, the testing of fermentation will not rely on density measurements which rely on gravity (as brewers do on Earth), instead using pressure to determine sugar content. As Han Ling, a fifth year bioengineering undergraduate student and the team’s leader, explained, “Converting the pressure buildup to fermentation progress is straightforward, as long as volume and original gravity – specific gravity before fermentation, hence our name – are known prior to the experiment.” Measuring roughly as wide as a soda can, their system is able to ferment yeast and worst to create beer, even under Lunar conditions. Looking to the future, Ashari and the team hope to see their experiment adapted for use on other planets – like Mars! Other proposed experiments that were entered in the competition included methods for photosynthesis to producing electricity in a Lunar environment. Beyond making beer, understanding how yeast will became in a Lunar environment is also important in the development of pharmaceuticals and yeast-containing foods, such as bread. It certainly is interesting to think about what kind of beers could be produced in an extra-terrestrial environments, isn’t it? Will future generations of brewers have the option of using locally-grown barley, wheat, hops, and yeast cultures to craft their beer? Will the use of Lunar or Martian water have an affect on the beers taste? And then there’s the matter of names and styles. Will Lunar brewers create a Dark Side of the Moon Stout? Will the people of Mars specialized in Red Ales? Like I said, interesting! 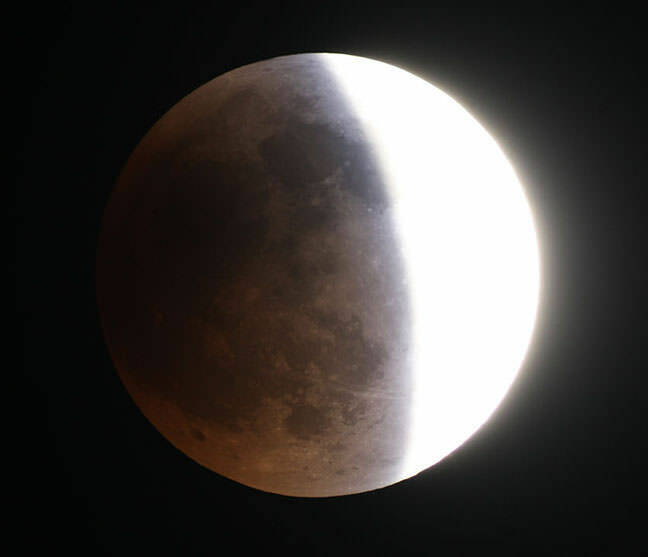 Ready for Wednesday’s morning lunar eclipse? Some people – and I envy them at times – treat an eclipse more casually. They enjoy the show with no desire to set up a telescope or take a photo. For those of us can’t part with our cameras, here’s a little guide to help you get better pictures. If you’re also into photography and would like to grab a few shots, here are a few tips on what equipment you’ll need and camera settings. 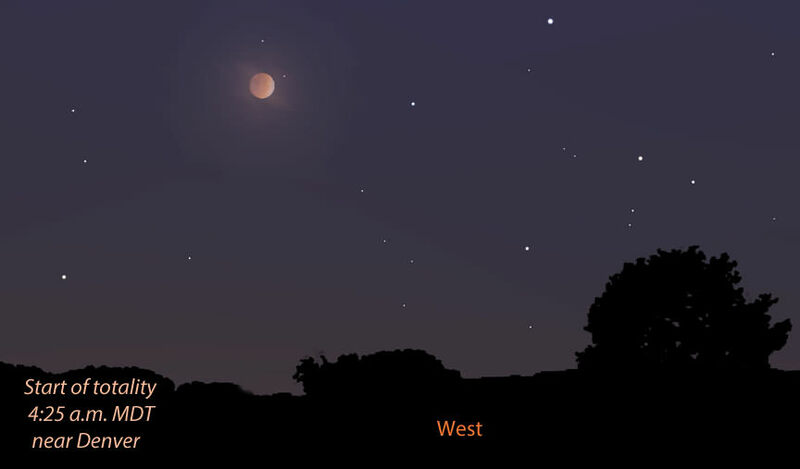 This eclipse offers unique opportunities especially for the eastern half of the country because the eclipsed moon will be low in the western sky near the start of and during morning twilight. In the Midwest at the start of the hour-long totality, the red moon will be about 20º (two fists) above the western horizon. From the East Coast the moon slips into total eclipse only a half hour before sunrise 6-7º high. So if you live in the eastern half of the country, find a site with a good view to the west. A low moon means easier framing with a pleasing foreground like a grove of fall trees, a church or distant line of mountain peaks. And the lower it drops, the longer the telephoto lens you can use to enlarge the moon relative to the foreground. When the moon is high in the sky it’s more difficult to find a suitable foreground. As the scene brightens during twilight, balancing the light of the dim moon, your photos will get even more interesting. Textures and details in foreground objects will stand out instead of appearing as silhouettes. Use the table below to plan when to watch depending on your time zone. The blanks mean the moon will have set by the time of the event. Penumbra first visible 4:45 a.m. 3:45 a.m. 2:45 a.m. 1:45 a.m. Partial eclipse begins 5:15 a.m. 4:15 a.m. 3:15 a.m. 2:15 a.m.
Total eclipse begins 6:25 a.m. 5:25 a.m. 4:25 a.m. 3:25 a.m.
Mid-eclipse 6:55 a.m. 5:55 a.m. 4:55 a.m. 3:55 a.m.
Total eclipse ends 7:24 a.m. 6:24 a.m. 5:24 a.m. 4:24 a.m. Partial eclipse ends ——— 7:34 a.m. 6:34 a.m. 5:34 a.m.
Penumbra last visible ——— ——— 7:05 a.m. 6:05 a.m. The full moon and even the partially eclipsed moon (up to about half) are so bright you can shoot a handheld photo without resorting to a tripod. Exposures at ISO 400 are in the neighborhood of f/8 at 1/250-1/500 second. Only thing is, all you’ll get is the moon surrounded by blackness. These exposures are so brief almost nothing will show in your foreground except for possibly moonlit clouds. That’s usually fine for the early partial phases. Once the moon is more than half smothered by shadow, open up your lens to a wider setting – f/2.8 to f/4 – or increase the exposure. Let the back of the camera be your guide. If the images look too bright, dial back. If too dim, increase exposure or open the lens to a wider aperture. While you can continue to shoot the partially eclipsed moon at f/8 from 1/30-1/125 second, you’ll miss the best part – the portion filling up with Earth’s red shadow. To capture that, break out the tripod, open the lens all the way up – f/2.8-f/4 – and expose at ISO 400 between 1/4 and 1 second. You can also shoot at ISO 800 and cut those times in half, important if you’re using a longish telephoto lens. Remember, Earth’s rotation means the moon’s on the move and will show trailing if you expose longer than a few seconds. On the other hand, this won’t be a problem if you’re shooting with a wide angle lens though they have their limits, too. During totality, expose anywhere from 1/2 to 5 seconds at f/2.8-4.5 at ISO 400. Let’s say you want to include both scenic foreground and stars in the picture using a wide angle or standard lens. Dial up the ISO to 800, open your lens wide and expose between 6-10 seconds. On the 6-second end you’ll catch only the brightest stars, but the moon won’t show trailing; on the longer end you’ll get lots more stars with some overexposure of the eclipsed moon. Of course, you can go to even higher ISOs and shorten exposure times considerably. But in all but the newest, high-end cameras that comes at the price of increased graininess and less color saturation. Where parts of the eclipse happen in twilight, even mobile phones may suffice. There should be enough light to capture a pretty scene with the moon just emerging from total eclipse and during the ensuing partial phases. Scientists have detected magmatic water — water that originates from deep within the Moon’s interior — on the surface of the Moon. These findings represent the first such remote detection of this type of lunar water, and were arrived at using data from NASA’s Moon Mineralogy Mapper (M3) carried aboard India’s Chandrayaan-1 lunar orbiter. The discovery represents an exciting contribution to the rapidly changing understanding of lunar water according to Rachel Klima, a planetary geologist at the Johns Hopkins University Applied Physics Laboratory (APL) in Laurel, Md., and lead author of the paper, “Remote detection of magmatic water in Bullialdus Crater on the Moon” published in the August 25 issue of the journal Nature Geoscience. See detailed reports of M3 data regarding hydroxyls in Bullialdus crater from NASA’s Lunar Planetary Institute (LPI) here. After examining the M3 data, Klima and her colleagues found that the crater has significantly more hydroxyl — a molecule consisting of one oxygen atom and one hydrogen atom — compared to its surroundings. “The hydroxyl absorption features were consistent with hydroxyl bound to magmatic minerals that were excavated from depth by the impact that formed Bullialdus crater,” Klima writes. In the ultimate example of science imitating art, engineers working with NASA’s Lunar Reconnaissance Orbiter recently beamed an image of the Mona Lisa to the LRO and back via laser beam in order to measure the rate of transmission between the spacecraft and Earth. This allowed them to then calibrate their software to correct for any discrepancies between the image sent and the one received, resulting in a picture-perfect result. Leonardo would definitely have approved. The iconic image traveled nearly 240,000 miles in digital form from the Next Generation Satellite Laser Ranging (NGSLR) Station at NASA’s Goddard Space Flight Center in Greenbelt, MD, to the Lunar Orbiter Laser Altimeter (LOLA) instrument on the spacecraft. By transmitting the image piggyback on laser pulses that are routinely sent to track LOLA’s position, the team achieved simultaneous laser communication and tracking. Flying over at an altitude of 135 km, NASA’s Lunar Reconnaissance Orbiter captured this lovely oblique view of the crater Aristarchus, looking down at the 40-km (25-mile) -wide crater’s southern rim from the west. The broad flank of Aristarchus’ 300-meter (980-foot) central peak and surrounding hills can be seen at left, casting lengthening shadows in the setting sun. Named after the Greek astronomer who first proposed a controversial heliocentric model for the Solar System in the 3rd century BCE, Aristarchus is a prominent crater located near the Moon’s northwestern limb within the geologically-diverse Oceanus Procellarum — the “Ocean of Storms.” Surrounded by rays of bright ejecta that extend down its stepped rim, the floor of Aristarchus drops 3.7 km (2.3 miles) below the surrounding lunar landscape. The bright material seen in the ejecta streaks seems to echo the patterns of light and dark material lining the slopes of Aristarchus’ central peak, suggesting that they may be the made of similar material. The impact that created Aristarchus an estimated 450 million years ago excavated subsurface material, melting and spraying it tens of kilometers over the surrounding plateau. It’s thought that the central peak is likely composed of the same stuff, dredged up by the impact and frozen in place. Future lunar explorers, should they ever visit this region, would be able to collect samples from the base of the central peak and compare them to samples from the bright rays to see if they match up, allowing researchers to learn about the composition of the material underlying the plateau from rocks scattered conveniently around the surface… this is the beauty of such (relatively) recent craters! The digging’s already been done for us. Read more about this on Arizona State University’s LROC site and explore a zoomable version of the original NAC frame here.